Finally, 365 days a year with Greg Heffley and Diary of a Wimpy Kid ! Author and illustrator Jeff Kinney has created a one-of-a-kind way for you to keep track of all of your tests, appointments, and activities during school, after school, on the weekends, over the holidays, and during winter and summer breaks. 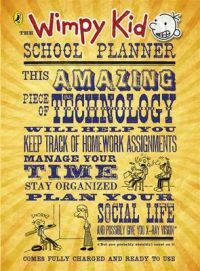 If you thought The Wimpy Kid Do-It-Yourself Book was fun, then just wait until you get your own portable Diary of a Wimpy Kid School Planner . It's filled with drawings on every page; all of your favorite characters; and columns, graphs, and charts all specially designed to help you track your most important notes, lists, and the information you'll need to survive middle school.